To further increase the fuel efficiency of the RAM truck for 2019, it got aerodynamic updates in addition to hybridization. There are now the active grills shutters and a front splitter, which will automatically lower 2.5 inches when driving above 35 mph. The Rebel trims or those with the 4×4 Off-Road Package do not have the splitter, but if they have air springs, this system makes up for it by lowering 0.6 inches when at speed. 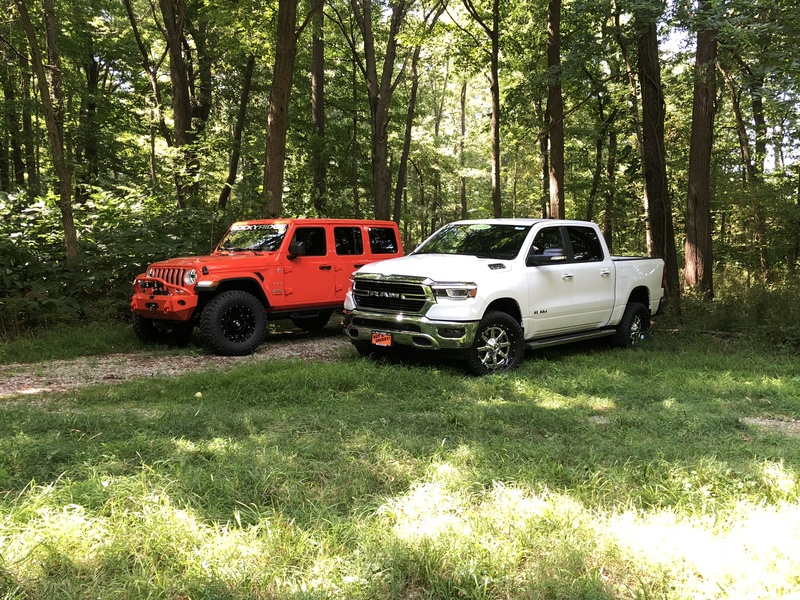 If you put the 2019 RAM truck side-by-side with the previous model year, you will notice that it is larger than before. It is also stronger yet lighter thanks to the use of high-strength steel that drops 100 pounds from the ladder-type frame. The new electronic parking brake is also 20 pounds lighter, and other, smaller changes dropped a few pounds here and there. Despite this weight loss, Crew Cab RAMs with the standard box are 3.9 inches longer and 4.1 inches wider in the wheelbase than before. Quad Cabs, however, are very similar in size to previous models. All RAMs for 2019 do measure a half-inch wider, and the overall height is nearly identical. Some of the most impressive changes for the 2019 RAM trucks are found inside the vehicle. You can now get a 12-inch touchscreen as part of the Uconnect 4 infotainment system on top trims. It includes Apple CarPlay, Android Auto, and navigation, plus the choice of split-screen or full screen. Lower trims still get the Uconnect 3 system, while some mid-level models get Uconnect 4 with an 8.4-inch screen. Other interior updates include more rear-seat legroom for the Crew Cab and available heated and cooled seats with recline functionality in the back.